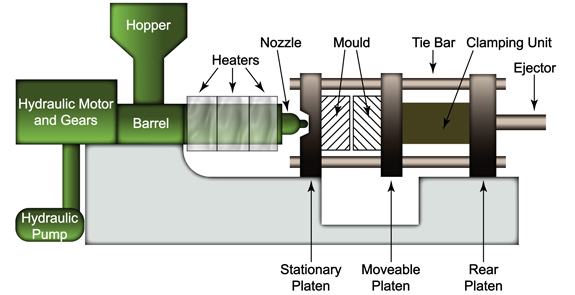 Of the various manufacturing techniques for Plastic Moulding, Injection Moulding is one of the most common. The materials comprise of Thermoplastics, which include: Polystyrene (lowest cost), Acrylonitrile Butadiene Styrene (ABS) (with a variety of applications, namely housing for electronics), Polyamide, and the most durable, Polypropylene, (super tough and most commonly used for containers), Polyethylene, and Polyvinyl Chloride (PVC) (a flexible material with an added compound commonly used on window frames). The key process in Injection Moulding is when the melted plastic is forced into a mould, the part of the machine that receives the plastic and shapes it accordingly. In layman's terms the basic idea in plastic moulding is inserting molten liquid plastic into a mould, and when allowed to cool, the mould is removed to reveal the object. As soon as the plastic cools to a solid state, the finished plastic is ejected from the press and mould. The popularity of this technique is its ability to be used in mass-production as well as for prototypes of products. Its origins go all the way back to 1870, when John Wesley Hyatt invented celluloid and injected it into a mould, producing billiard balls. Essentially he paved the way for the modern plastics industry. A precursor to Injection moulding techniques of today, Hyatt and his brother Isaiah patented an injection-moulding machine that used a plunger in 1872. 3. Cooling - that enables it to retain its shape. Injection moulding machines, (also called presses) involve a high degree of pressure, which help keep the mould closed during the injection process.